You know what they say: “When life hands you lemons, ask the BWH Advice Gurus for lemonade”. Starting a new job comes with more than just a new boss and new responsibilities—it comes with a whole new lifestyle! As exciting as it is, it’s OK to feel uneasy if you and your partner have new priorities. Know that things will eventually get back to a new normal, but in the meantime make sure to over-communicate what your new schedules look like. This is a great time to explore new opportunities and get to know yourself and new coworkers (but also make sure you’re setting some time aside to prioritize your partner). No matter how your day shakes up, make sure to ask them about theirs before you go to bed. Prioritize a bit of time for the two of you each week, too. Try sneaking in an early breakfast date or a happy hour before meeting up with other friends. Such a great question! My now-husband and I worked together the entire time we were dating and still do now. So, we definitely had to set up some home guidelines to keep our relationship a priority as well. 1. Set up boundaries for “work chat” at home. Our rule was that we could talk about work-related things for 30 mins once walking through the door, but then that was it. 2. This is an obvious one, but commit to a date night. Whether it’s weekly or monthly, make it happen. Don’t cancel. It’s an important meeting just like all your other ones. 3. Have a “family day.” Ours is Sunday. This is a day where we absolutely do not do anything work-related under any circumstances. Sorry, Sunday Scaries! Whether we’re just cleaning the house, binging Netflix, or going out and doing something, this is our “date day” and work does not interfere. I say: You do you, babe! 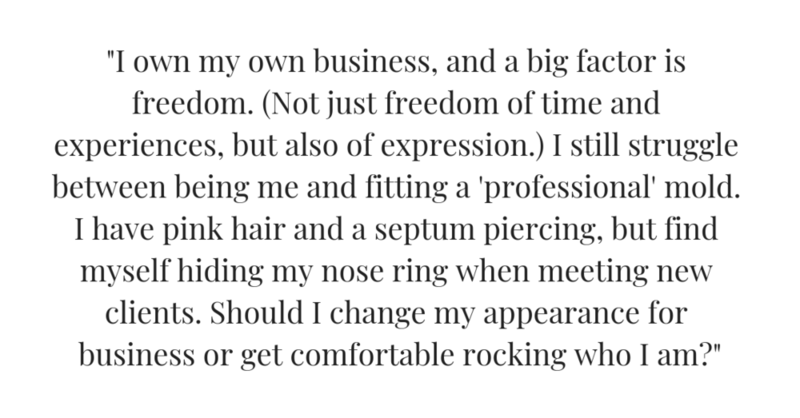 While professional attire is still recommended for meetings and events, I think every working professional in 2019 has learned that nose rings and hair dye have nothing to do with your ability to do your job, and do it damn well. If your behavior, rhetoric and leadership is professional, your bases are covered. (And if enough of us babes start embracing our personal expression, maybe pink hair will become the new “business do.”) Or, better yet, we’ll focus our judgements on the quality of our work and merit of our ambition. I feel that being professional and your personal style are mutually exclusive. But, you should feel confident in yourself and “be the change you wish to see.” Break the mold and rock it. A hard worker is undeniable, regardless of hair color. You should feel comfortable. This is an encompassing statement. You should feel comfortable with who you are, but also what you feel like when you walk in a room. If you’re meeting with partners at the biggest law firm in town and selling your business, be prepared to feel … a little different. I’m not saying you can’t overcome this difference (and in fact, once you prove your worth, it will help you stand out), but be prepared. Keep your pink hair styled, rock an amazing suit in those meetings and you’ll set the tone just where you want it. If you’re great at your job, you can style yourself how you desire. I’ve seen doctors with tattoos over both arms, attorneys with multiple piercings and many a professional with pink/purple/green hair. The key is, they were all great at their jobs—so no one really gave it a second glance. Headphones, plants and work-breaks. And an extra pair of headphones JIC. It’s a rough transition to hot-desking, but it may help you to consider some of the perks you’ll benefit from in the new format. When your desk can be anywhere, your desk—well, can be anywhere. As a stationary employee it can be tough to spend time away from your desk, because people know that’s where they go to find you. When you don’t have an assigned desk, you gain the freedom of flexibility. Work where it feels right on the day. If you need sun, find the sun. If you need quiet and calm, find a hidden corner. If you need to escape, find a coffee shop or work from home. Avoid the temptation to try and stake your claim to a desk or show up early every day to jump on the one you really like. You’ll create an anxiety loop that’s difficult to break. Don’t become territorial. There is an emotional freedom in holding things with an open hand; it feels better to dislike your Monday desk when you’re not fixated on the one you had on Friday. Above all, yeah—invest in a good pair of headphones. Now is the time to indulge. Bose’s QuietComfort line is the tippy-top for Bluetooth headphones (if you’re going to be untethered, might as well be untethered), but Sony and Audio-Technica also make reasonably priced, high-quality sets. Keep a set of travel wipes in your bag to clean surfaces before you sit down, and carry around a (durable) trinket you can pull out to put on your workstation in the morning. If you can’t make your desk yours, at least make the day yours. You’ve got this!